Graffiti in the Sydney area has spiked, taking over historic landmarks, storefronts and even residential communities. 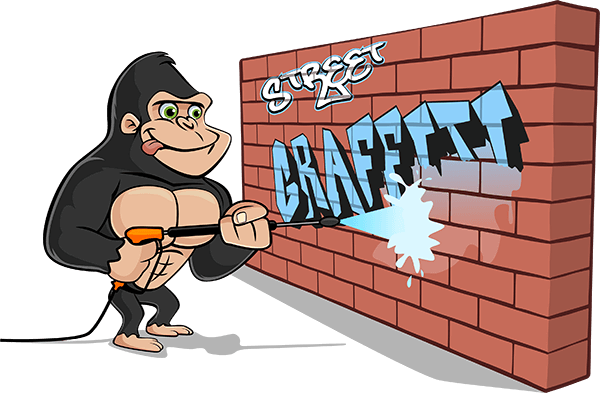 If you have been the unfortunate recipient of some of these unwanted designs, call our Gorillas for your Sydney graffiti removal. A clean and graffiti-free space is always within reach with our Gorillas, so do not hesitate to book an appointment. The last several years have seen instances of graffiti vandalism on the rise, but these occurrences have exploded throughout 2017. Nowhere inside the Sydney area seems to be safe and even though there is no way to stamp out graffiti, there was ways to deter it. The longer graffiti is allowed to sit on surfaces, the more damage it can do. Exposure to the elements allows paint stains to bake into the facade. This might make removal even more difficult but it is not your biggest worry either. Graffiti vandals operate on a competitive system, meaning one tag on your property will attract more. Leaving one tag sprayed across your home or business can turn into several in no more than a week. This is why our Gorillas strive for same-day removal whenever it is possible. Graffiti might have a bad reputation but our Gorillas have a great one and we can handle any stain that we are thrown. When it comes to the graffiti in your community, it is important to know your enemy. There are a ton of different types of spray paints, all at the disposal of vandals. In order to properly address the staining around your space, we need to know what we are up against. Luckily for our clients, our experienced Gorillas have been around the block and dealt with all makes and models of aerosol paints. Sometimes a Sydney graffiti removal is as simple as an application of our Gorilla Foam cleansers and a good scrubbing. Other instances, require a bit more elbow grease. In the past, our Sydney graffiti removal has even involved pressure washers or a new paint job. Whatever the problem, our Gorillas will find a solution for you.